Okay, this is from Brazil too, but this time from the Adamantina Formation (86 million years ago). 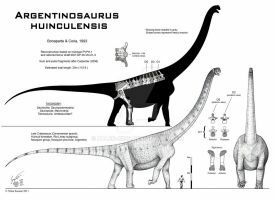 Gondwanatitan is an advanced titanosaur sauropod, but does not live up to its name. At merely 25 feet long and maybe weighing a few little tons, it was slender and lightly built and among the smallest of all titanosaurs. The armor is fine, but the mouth looks a little beakish due to the color pattern... can't really see the teeth, are you sure you did that part right? Yes, well...I added a few um....'lips' per artistic license to be honest....that's not a beak, it's just the color of the front of the face. I mean, without a lip to cover the teeth and gums, wouldn't they....dry out? Yes, they did have lips. I don't dispute that, I'm not one of those weirdos who insist on drawing sauropods without lips or duckbills without cheeks. It's just that making them a different color at the front gives the impression of a beak like those of iguanodons. Not saying the color is wrong, just that the color scheme might confuse people who can't see the teeth so well. BTW I don't think most sauropod lips were long enough to completely cover the teeth, especially not in big-toothed species. Bakker restored them that way but I take a more cautious route. The gums would easily have been covered though. Oh...then okay! At least I made the front of the jaws smooth and black, not with ridges along it! yeah, ridges would really look like a beak. Awesome! I like that one very much! Thanks a lot! This is gonna be the REAL Vasika style now onwards!!!! And 25 m long is definitely not small. Small is 13 m long Maxakalisaurus. Hw big is that in meters? I just love this! Brings me to another place.. This is just so..... ahhh I can't think of any words good enough to describe how wonderful this is! Want to see everything else? I saw, there's so much awesomeness I think my eyes melted ._. Excellent work, you are definitely improving! Thanks! Interesting to see the armored Plateosaurus! In the descriptions it mentions that the dermal integument of the sauropod Diplodocus has been widely misinterpreted, that it was actually covered in bony scutes. So armored sauropods in general are not completely speculative. You're god, man. It's amazing. Wow, amazing detail on the trees! Thanks a lot!! FIVE days, and what I came up with!